Background: Diagnosing Pulmonary Thromboembolism (PE) remains difficult due to its non-specific symptoms and signs. There is currently no single, reliable, non-invasive diagnostic test sufficiently sensitive to consistently diagnose suspected PE. The aim of this study was to determine the sensitivity and specificity of multi-organ ultrasonography combined with clinical scores and elevated D-dimer levels for the diagnosis of non-massive PE. Materials and Methods: Between November 2015 and July 2016, a total of 92 consecutive patients with a moderate to high clinical suspicion of PE were evaluated in the emergency setting of our hospital. Those who met the inclusion criteria were enrolled into the study. The demographic, clinical and radiological features of the included patients and their laboratory findings were recorded. At the first assessment the Wells clinical scores were calculated and plasma D-dimer levels were measured using a quantitative enzyme-linked immunosorbent assay. Patients included in the study underwent Thoracic Ultrasonography (TUS), duplex sonography of their lower extremity veins, echocardiography and multislice Computerized Tomography Pulmonary Angiography (CTPA) within 24 h. All statistical analyses were carried out using the SPSS software (version: 16.0; SPSS Inc., Chicago, IL, USA). The chi-squared test was performed to compare categorical variables between groups, while ttests were used for normally distributed continuous variables. Analyses of sensitivity, specificity, Negative Predictive Value (NPV) and Positive Predictive Value (PPV) were conducted using cross-tables in SPSS. A p-value<0.05 was considered significant. Results: Of the 92 patients, 74 met the inclusion criteria and were included in the study. The mean age of the patients was 55.2 ± 17.4 y old, and 56.8% were male. While PE was diagnosed in 49 (66.2%) patients according to the results of the multislice CTPA (the reference test), PE was not detected in 25 (33.8%) patients. When multi-organ ultrasonography was consistent with PE and evaluated together with increased Ddimer levels, the sensitivity for identifying PE was found to be 89.8%, specificity was 88%, PPV was 93.6% and NPV was 81.5%. Conclusion: Multi-organ ultrasonography is a more effective and reliable test for diagnosing PE than single-organ ultrasonography. It has a high sensitivity and specificity, especially in the emergency setting. This approach may facilitate immediate treatment decisions when CTPA is not available or feasible. Thoracic ultrasonography, Pulmonary thromboembolism (PE), Wells clinical score. The diagnosis of pulmonary thromboembolism (PE) remains difficult due to its non-specific symptoms and signs, and many patients die undiagnosed or untreated [1-5]. A timely diagnosis of PE is crucial as prompt and appropriate management can decrease mortality and morbidity. However, this is often confounded by a non-specific clinical presentation . There is currently no single, reliable, non-invasive diagnostic test sufficiently sensitive for the consistent diagnosis of suspected PE. Pulmonary angiography is considered the gold standard for the diagnosis of PE, however, it is an invasive procedure associated with some risk, and is under-utilized in traditional diagnostic strategies. Computerized Tomography Pulmonary Angiography (CTPA) is widely preferred as the reference method for non-invasive diagnosis of PE, but the diagnostic yield in sub-segmental PE is still debated [7,8]. CTPA is also not available in some hospitals and exposure of the patient to radiation is an issue [1-4,9]. It is also not suitable for use in pregnant women and patients with renal failure. These factors suggest the need for an alternative, simple, non-invasive and widespread bedside diagnostic approach . The value of Thoracic Ultrasonography (TUS) in the diagnosis of acute PE has been reported in previous studies [1,3,4,11,12]. Many authors who have evaluated the diagnostic role of ultrasonography in PE diagnosis, have focused on lung ultrasonography [1,13,14]. Only Nazerian et al. have studied the diagnostic accuracy of multi-organ ultrasonography for detecting PE . The aim of this study was to determine the sensitivity and specificity of multi-organ ultrasonography combined with clinical scores and elevated D-dimer levels for diagnosing nonmassive PE. This study was designed as a prospective investigation. Between November 2015 and July 2016, a total of 92 consecutive patients with a moderate to high clinical suspicion of PE, and who were evaluated in the Department of Emergency Service in a Chest Disease and Thoracic Surgery Training and Research Hospital, were enrolled in this study. Patients with the clinical signs, symptoms and risk factors for PE, and who had a moderate to high clinical suspicion of PE, were included. All these patients had an acute onset of typical symptoms of PE, including dyspnea, pleuritic chest pain, tachypnea and syncope combined with the presence of risk factors. These patients were hospitalized for diagnostic procedures and treatment of PE after clinical evaluation in the emergency department. Patients with a moderate to high clinical suspicion of PE who were evaluated in the Emergency department of the Chest and Thoracic Surgery Disease Education and Research Hospital were considered for inclusion in the study. The presence of risk factors for PE, together with unexplained dyspnea, pleuritic pain, tachypnea and unexplained blood gas abnormalities, and radiological findings indicated a high clinical suspicion of PE. The presence of risk factors for PE and the presence of dyspnea or hypoxemia that could be explained by conditions other than PE, or the presence of unexplained dyspnea or hypoxemia with no risk factors for PE, were considered to indicate a moderate clinical suspicion of PE. Risk factors included the presence of a lower extremity fracture, malignancy, obesity, congestive heart failure and post-partum period, a history of venous thromboembolism, recent surgery, and incidence of a previous PE. Patients who had a clinical indication for an acute massive PE in the Emergency Department (e.g., hemodynamic failure) were referred to the İntensive Care Unit and were not included. Patients with a previous history of allergy to IV contrast were excluded, as were pregnant patients and those whose serum creatinine was>1.8 mg/dL. Patients that did not agree to participate in the study were not enrolled. The demographic, clinical and radiological features of the included patients, and their laboratory findings, were recorded. At the first assessment in the Emergency Department the Wells clinical scores of the patients were calculated and plasma Ddimer levels were measured using a quantitative enzymelinked immunosorbent assay. After hospitalization, patients included in the study underwent Thoracic Ultrasonography (TUS), duplex sonography of their lower extremity veins, echocardiography and multislice CTPA within 24 h. Patients were referred to a cardiologist who performed echocardiography and who was blinded to the results of the prior examinations. Multislice CTPA was used as the reference method for PE diagnosis. A radiologist who was blinded to the results of the other examinations interpreted the CTPA scans and duplex sonography. TUS was performed by an experienced chest physician. The thoracic ultrasound was performed with the patient in a sitting position, arms raised and hands placed behind the head in order to extend the intercostal spaces and rotate the scapula outward. TUS was performed by an experienced chest physician who had completed a postgraduate thoracic ultrasonography course, and who was trained by a radiologist. The Mindray Diagnostic Ultrasound System DC-7 (China) device with 3.5 MHz convex probe was used for the examination. The sonographic examination was performed by systematically examining all chest areas from superior to inferior. A typical wedge-shaped triangular or rounded pleurabased hypoechoic lesion suggested a pulmonary sub-pleural infarct. Pleural effusion and sonographic images compatible with consolidation were recorded. Standard contrast material-enhanced multi-detector CT was performed using a 64 section (Aquilion 64: Toshiba Medical Systems) CT scanner. For the diagnosis of pulmonary embolism, 0.5 mm sections of the entire chest were acquired. Acquisitions were performed during a single breath hold that lasted for 12-14 s or less. A total of 100 mL contrast agent (Omnipaque 350, GE Healthcare, Ireland, Cork) was injected into the antecubital vein with an intravenous catheter, followed by a 40 mL saline bolus chaser. A radiologist blinded to the clinical data and other examination results interpreted all multislice CTPA scans. The diagnosis of a pulmonary embolism was confirmed by the presence of at least one filling defect in the pulmonary artery. Duplex sonography of lower extremity veins was performed using a 4-8 MHz linear probe via a Mindray Diagnostic Ultrasound System DC-7 (China) and consisted of short axis visualization and compression of the common and superficial femoral veins and of the popliteal veins. A DVT was defined as an absence of total vein collapse during compression. Heart ultrasonography was performed using a 2-5 MHz phased array probe. Right ventricular dilatation, high pulmonary arterial pressure, and evidence of a D-shaped inter-ventricular septum were recorded. Moreover, thrombi in the right cavity and signs of pericardial effusion and aortic dissection were recorded when detected. Multi-organ ultrasonography was considered diagnostic of PE when TUS detected at least one pulmonary sub-pleural infarct, or duplex sonography of the lower extremity veins detected DVT or right ventricular dilatation or thrombi in the right cavities. Alternative diagnoses to PE could also be detected via ultrasonography, such as pneumonia, pleural effusion, and pericardial effusion. All statistical analyses were carried out using the SPSS software (version: 16.0; SPSS Inc., Chicago, IL, USA). The chi-squared test was performed to compare categorical variables between groups, while t-tests were used for normally distributed continuous variables. Sensitivity, specificity, NPV and PPV were assessed using cross-tables in SPSS. A p value<0.05 was considered significant. This study was approved by the Local Ethics Committee of the Institution and was conducted in accordance with the ethical principles stated in the Declaration of Helsinki. Informed consent was obtained from each patient included in the study. Of the 92 patients admitted to the emergency department of our hospital with a preliminary diagnosis of moderate to high clinical probability of PE, 74 patients were finally included in the study. The mean age of the patients was 55.2 ± 17.4 and 56.8% were male. The mean D-dimer value was 3.6 ± 3.0 mcg/mL. The mean Wells clinical score was 4.9 ± 2.1. While PE was diagnosed in 49 (66.2%) patients according to the results of the multislice CTPA (regarded as the reference test), PE was not detected in 25 (33.8%) patients. At least one additional disease was detected in 54.1% of the patients, and 67.6% had risk factors for PE. The most common symptoms among patients at admission were identified as dyspnea (87.8%) and chest pain (78.4%). Lung X-rays showed abnormalities in 87.8% of the patients, and the most frequent findings were obtuse sinus (32.4%) and linear atelectasis (24.3%). The lung X-rays were normal in 12.2% of the patients included in the study. The diagnostic distribution of the 25 patients in whom PE was not detected was identified as 44% with pneumonia+parapneumonic effusion, 16% with deep vein thrombosis, 24% with a COPD attack and 16% with congestive heart failure (Figure 1). The comparison of the PE and non-PE groups with respect to age, gender, additional diseases, symptoms, and findings did not yield any significant differences (Table 1). On the other hand, the mean Wells clinical score and the mean D-dimer value were found to be significantly high in the group with PE (p:0.001, p:0.001, respectively, Table 2). Table 1. The comparison of the groups with respect to demographic characteristics, additional diseases and the presence of risk factors. US: Ultrasonography; TUS: Thoracic Ultrasonography. Table 2. The comparison of groups with respect to the wells clinical score, D-dimer and ultrasonographic findings. A comparison of the groups according to the results of the ultrasonographic imaging methods showed no statistically significant differences regarding PE-related echocardiography findings. The rate of thrombosis was significantly high in the duplex sonography of lower extremity veins of the PE group (p:0.002). The occurrence of ultrasonographic findings consistent with pleural fluid and consolidation was similar across the groups, and the occurrence of pleural-based hypoechoic wedge-shaped or round lesions consistent with pulmonary infarction was significantly high in the PE group (p: 0.001, p:0.012, respectively, Table 2). Parameters that were deemed statistically significant in the intergroup comparison were assessed together, and the sensitivity, specificity, PPV and NPV of multi-organ ultrasound were calculated (Table 3). Multi-organ ultrasonography was considered diagnostic of PE when TUS detected at least one pulmonary sub-pleural infarct, or duplex sonography of lower extremity veins detected DVT or right ventricular dilatation or thrombi in the right cavities. When multi-organ ultrasonography was consistent with PE, the sensitivity for diagnosing PE was identified as 89.8%, specificity was 76.0%, PPV was 88.0% and NPV was 79.2% (Table 3). When multiorgan ultrasonography was consistent with PE and evaluated together with elevated D-dimer levels, the sensitivity for identifying PE was identified as 89.8%, specificity as 88.0%, PPV as 93.6% and NPV as 81.5% (Table 3). Table 3. The sensitivity, specificity, PPV and NPV of clinical scoring and ultrasonographic imaging methods in combination. In this study, the value of clinical scoring in combination with multi-organ ultrasonography in patients with a moderate to high clinical probability of PE was examined and it was observed that multi-organ ultrasonography is feasible in patients hospitalized with a suspicion of PE. The combination of multi-organ ultrasonography and D-dimer increase was shown to have a high sensitivity and specificity for diagnosing patients with suspected PE. This cheap and fast multi-organ ultrasound that can be performed at the bedside may be particularly valuable in situations where MS-CTPA is not available or if the delivery of contrast agents is prohibited, and in conditions such as pregnancy or kidney failure. Currently, MS-CTPA is the standard of care in patients with clinically suspected PE. However, it is costly and is not available at every medical center; it is also associated with potentially harmful radiation and the application of a contrast medium. Therefore, PE and its diagnosis continue to be a significant medical problem, especially in emergency departments. When it comes to the diagnosis and treatment of PE an accurate diagnosis and early treatment are important . When comparing the diagnostic methods, US has some advantages that make it more appropriate in the case of emergencies and for the bedside diagnosis of PE, such as safety, cost-effectiveness, portability, and wide availability. Previous studies in the literature have examined the diagnostic value of single ultrasonographic methods such as thoracic, cardiac, and venous duplex ultrasonography for the diagnosis of PE. Sub-pleural infarcts detected by thoracic US show a sensitivity of 60 to 98%, and a specificity of 50 to 99% [1,3,4,14-17]. The sensitivity of echocardiography for PE has been reported to range from 31% to 72%, and specificity between 87% and 98% was reported [1,18-22]. DVT detected by lower extremity venous US showed a sensitivity of 39% to 55% and a specificity of 96% to 99% [1,4,12]. When the diagnostic value of single organ ultrasound methods for diagnosing PE was assessed in our study, specificity was found to be high, but sensitivity was low. The sensitivity and specificity of the single ultrasonographic methods in our study were similar to Nazerian’s study, and lower when compared to other studies. There are a small number of studies that have investigated the diagnostic value of combinations of ultrasonographic methods for diagnosing PE [15,21,23]. In the study conducted by Grifoni et al., the sensitivity and specificity of the combination of venous and cardiac ultrasound in the diagnosis of PE was reported as 89% and 74%, respectively . In another study by Mansencal et al., the sensitivity and specificity of the combination of lower extremity venous duplex ultrasound and echocardiography were reported as 87% and 69%, respectively. However, in both studies more complex methods that cannot be applied universally were used to evaluate the right ventricle . In the study conducted by Nazerian et al., the specificity of single ultrasonographic methods in the diagnosis of PE was high. However, their sensitivity was low. In this study, we observed that the sensitivity and specificity for the diagnosis of PE increased significantly with multi-organ ultrasonography. Researchers have emphasized that in conditions where MSCTPA is unavailable, the use of multi-organ ultrasonography may be more effective than single organ ultrasonography for diagnosing PE . In our study, multi-organ ultrasonographic imaging methods were also investigated in combination with the Wells clinical score and D-dimer increase for diagnosing PE. Although the specificity of single organ ultrasonography for diagnosing PE was high, the sensitivity detected was low. We observed that the combined use of multi-organ ultrasonography and D-dimer increase yielded better results. The small sample size was one of the limitations of the study. A further limitation was the non-simultaneous use of multiorgan ultrasonography due to thromboembolism being a dynamic process associated, not only with recurrent embolization, but also with spontaneous lysis. Multi-organ ultrasonography tests were performed by an experienced radiologist and chest specialist with at least three years of experience in ultrasonography. Application of the ultrasonographic methods by anyone with less experience may lower the diagnostic accuracy. Although the sample size was small, the data suggests that multi-organ ultrasonography is a more effective and reliable test than single-organ ultrasonography for diagnosing PE with a high sensitivity and specificity. This approach may facilitate immediate treatment decisions when MS-CTPA is not available or not feasible. Mathis G, Blank W, Reissig A, Lechleitner P, Reub J, Schuler A. Thoracic ultrasound for diagnosing pulmonary embolism: A prospective multi-center study of 352 patients. Chest 2005; 128: 1531-1538. Hoffmann B, Gullett JP. Bedside transthoracic sonography in suspected pulmonary embolism: A new tool for emergency physicians. Acad Emerg Med 2010; 17: 88-93. Reissig A, Kroegel C. Transthoracic ultrasound of lung and pleura in the diagnosis of pulmonary embolism: A novel non‑invasive bedside approach. Respiration 2003; 70: 441-452. Reissig A, Heyne JP, Kroegel C. Sonography of lung and pleura in pulmonary embolism: Sonomorphologic characterization and comparison with spiral CT scanning. Chest 2001; 120: 1977-1983. Pfeil A, Reissig A, Heyne JP, Wolf G, Kaiser WA, Kroegel C. Transthoracic sonography in comparison to multislice computed tomography in detection of peripheral pulmonary embolism. Lung 2010; 188: 43-50. Mastruzzo C, Perracchio G, Poidomani G, Romano M, Crimi N, Vancheri C. Sub-segmental pulmonary embolism: Value of thoracic ultrasound for diagnosis and follow-up. Inter Med 2008; 47: 1415-1417. Fedullo PF, Tapson VF. The evaluation of suspected pulmonary embolism. N Engl J Med 2003; 349: 1247-1256. Musset D, Parent F, Meyer G. Diagnostic strategy for patients with suspected pulmonary embolism: a prospective multi-centre outcome study. Lancet 2002; 360: 1914-1920. Mayo JR. Radiation dose issues in longitudinal studies involving computed tomography. Proc Am Thorac Soc 2008; 5: 934-939. Mohn K, Quiot JJ, Nonent M, Lacut K, Le Gall G, Couturaud F. Transthoracic sonography of the lung and pleura in view of a suspected pulmonary embolism: A Pilot Study. J Ultrasound Med 2003; 22: 673-678. Le Gal G, Righini M, Sanchez O. A positive compression ultrasonography of the lower limb veins is highly predictive of pulmonary embolism on computed tomography in suspected patients. Thromb Haemost 2006; 95: 963-966. Elias A, Colombier D, Victor G. Diagnostic performance of complete lower limb venous ultrasound in patients with clinically suspected acute pulmonary embolism. Thromb Haemost 2004; 91: 187-195. 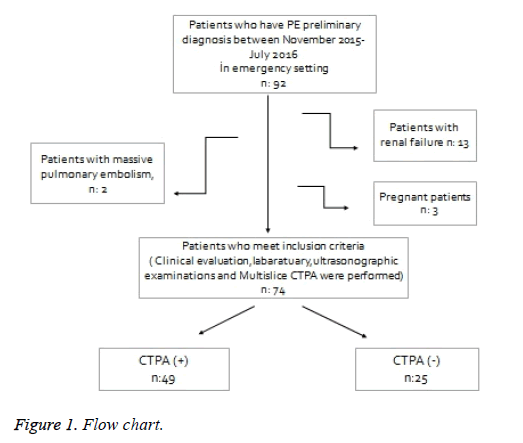 Niemann T, Egelhof T, Bongartz G. Transthoracic sonography for the detection of pulmonary embolism-a meta-analysis. Ultraschall Med 2009; 30: 150-156. Comert SS, Caglayan B, Aktürk U, Fidan A, Kıral N, Parmaksız E, Salepçi B, Kurtuluş BA. The role of thoracic ultarsonography in the diagnosis of pulmonary embolism. Ann Thorac Med 2013; 8: 99-104. Nazerian P, Vanni S, Volpicelli G, Gigli C, Zanobetti M, Bartolucci M, Ciavattone A, Lamorte A, Veltri A, Fabbri A, Grifoni S. Accuracy of point of care multi-organ ultrasonography for the diagnosis of pulmonary embolsim. Chest 2014; 145: 950-957. Squizatto A, Rancan E, Dentali F. Diagnostic accuracy of lung ultrasound for pulmonary embolism: a systematic review and meta-analysis. J Thromb Haemost 2013; 11: 1269-1278. Miniati M, Monti S, Pratali L. Value of transthoracic echocardiography in the diagnosis of pulmonary embolism: results of a prospective study in unselected patients. Am J Med 2001; 110: 528-535. Rudoni RR, Jackson RE, Godfrey GW, Bonﬁglio AX, Hussey ME, Hauser AM. Use of two-dimensional echocardiography for the diagnosis of pulmonary embolus. J Emerg Med 1998; 16: 5-8. Jackson RE, Rudoni RR, Hauser AM, Pascual RG, Hussey ME. Prospective evaluation of two-dimensional transthoracic echocardiography in emergency department patients with suspected pulmonary embolism. Acad Emerg Med 2000; 7: 994-998. Perrier A, Tamm C, Unger PF, Lerch R, Sztajzel J. Diagnostic accuracy of Doppler-echocardiography in unselected patients with suspected pulmonary embolism. Int J Cardiol 1998; 65: 101-109. Grifoni S, Olivotto I, Cecchini P. Utility of an integrated clinical, echocardiographic, and venous ultrasonographic approach for triage of patients with suspected pulmonary embolism. Am J Cardiol 1998; 82: 1230-1235. Bova C, Greco F, Misuraca G. Diagnostic utility of echocardiography in patients with suspected pulmonary embolism. Am J Emerg Med 2003; 21: 180-183. Mansencal N, Vieillard-Baron A, Beauchet A. Triage patients with suspected pulmonary embolism in the emergency department using a portable ultrasound device. Echocardiography 2008; 25: 451-456.